Best and most comfortable sneakers I have ever owned. Own several pair of elevator shoes and these sneakers are ten times better. As always thank you for great service and fast shipping. I was worried they would look like women's shoes in person. I was wrong, they are masculine, discrete and stylish. Will definitely order more. Shoes are nice and comfortable. Fits perfectly as expected. It's worth it for 129 bucks. Looks good and nice. Awesome shoes! it's well worth it!!! Great quality and good looking. Professional shoes fit for a lawyer. Also, arrived when they said it would. . Very nice and stylish. No one will know they are elevator I promise you! These look like high end adidas or puma sneakers. Very nice and very comftarble. They do not look like elevator shoes at all. So happy that I found this company! 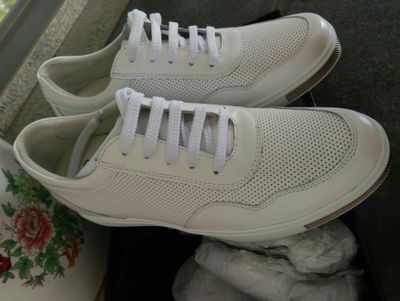 Just look like normal high-quality casual shoes. I highly recommend, and I need to remind you that if you are the first time to wear elevator shoes, you'd better choose a larger size or measure you foot size at home before buying these.